Pierre Brasseur (Le Quai des brumes, Les Enfants du Paradis) is Dr Génessier, a brilliant and obsessive plastic surgeon driven by the need to restore his daughter’s disfigured face and push the boundaries of his field. Aided by his loyal assistant Alida Valli (The Third Man, Suspiria), who lures young women to his secluded chateau in pursuit of his dark quest. Eugen Schüfftan’s (The Hustler) stunning cinematography lends the chateau an almost Cocteau-like life of its own, and Edith Scob (Judex, Holy Motors) is quite remarkable as the ravaged beauty. 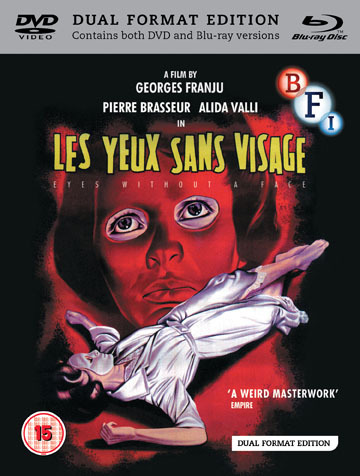 Eyes Without a Face is at once cruel and tender - highlighting Georges Franju’s unique blend of pulp, horror and poetry, it has, in the decades since its release, been a major influence on filmmakers such as Jesús Franco, John Carpenter and, more recently, Pedro Almodóvar.